p(blue). Editor's note: This piece first appeared on the Huffington Post. The ongoing BP oil spill has pretty much beaten me into submission. It hasn't slowed down my eggplant, though. The plant's leaves are, like the rest of us in South Florida, limp from the heat, but it's produced one last harvest — hearty, plump, and glossy, with stylish lavender and white striations. Rich in fiber and antioxidants, eggplant is a nightshade. Like its fellow nightshade the tomato, it's actually a fruit, and is about as versatile. You can prepare eggplant a bazillion ways, and through the ages, every ethnicity has. We're not just talking eggplant parm here. There's Provençal ratatouille, Italian caponata, Middle Eastern baba ghanoush (eggplant roasted, blistered, and puréed with garlic, lemon, and tahini), and Turkish imam bayeldi (slow-roasted stuffed eggplant), whose name apparently means "the imam fainted with pleasure." There's sweet and spicy Szechuan eggplant, sultry Indian bhangan bharta, smoky Moroccan eggplant salad, even Moroccan candied eggplant (okay, an acquired taste, but better than you'd think). It's prepared all over and grown all over, with myriad different varieties, from the big purple beauties we're used to here to small yellow Thai eggplants and little pale ones that really do look like eggs. Commercially grown, eggplant is among your cleaner veggies, with low pesticide residue. Mine is an Italian varietal, and like everything I grow, it's organic. It's absurdly easy, even for an untalented gardener like me. The eggplant pretty much tells me what to do. I thought it was history after Miami's January cold snap, but it came back of its own accord. Like the satirist Horace wrote back in 60 B.C. or so, "You can drive out nature with a pitchfork, but she'll keep coming back." Of course it was a pitchfork Horace was talking about, not a deepwater oil rig. That's going to take longer for nature — and us — to recover from. But we're not down for the count. My eggplant is proof. I have a feeling Paul Cezanne felt the same way. 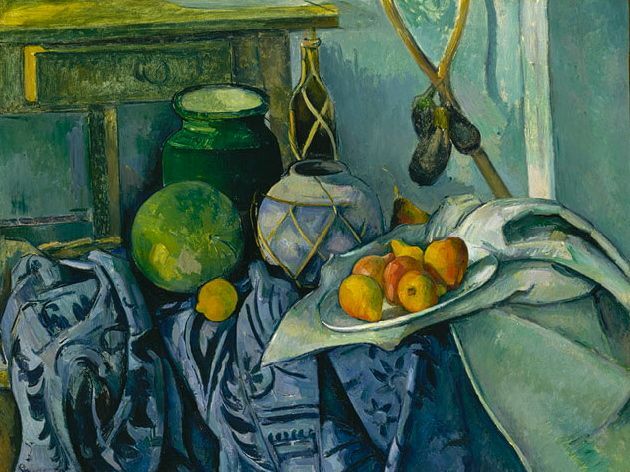 In the 1890s, the Post-Impressionist painted Still Life With Ginger Jar and Eggplants. I have to say, his eggplants look kind of flaccid, not at all the full, glossy thing mine is, but the painting works its own still-life magic. Cezanne's work captures a cluttered table, something we wouldn't take time to notice, but by rendering it in oil, he makes time hold its breath. We become aware of color, shape, pattern, and light, aware that even an eggplant can be important. There's no telling the long-term effects of the BP spill, which continues to gush after nearly three months. But we're still here. Right now. In the moment. And in this moment, I have to stop bemoaning the oil spill I can't control and be grateful for nature's benevolence, the everyday miracle of this eggplant right before me. I can even try to repay the favor. Growing food, producing it as well as consuming it, is a way we can all give back to the earth an infinitesimal fraction of what we take from it. Even growing a pot of fresh herbs in a sunny window counts. Being green is not just about being environmentally responsible and sustainable. It's about vibrancy, renewal, coming to the world fresh and hopeful. What grows in my own backyard reminds me there is still life with eggplant.